Essential articles and videos by topic experts. 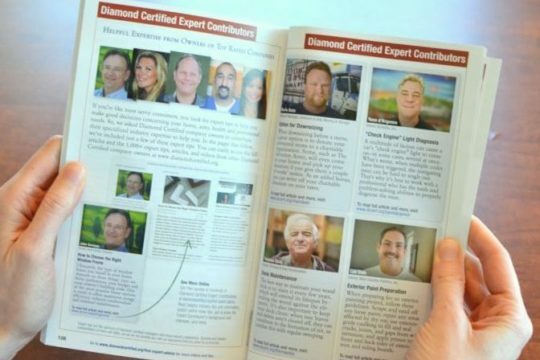 Watch this video on the Diamond Certified Resource: the most accurate and trustworthy way to find local companies rated Highest in Quality and Helpful Expertise®. We’ve all felt the joy of choosing a good local company and, unfortunately, the pain when we mistakenly choose a bad one. The problem is, every company claims to be good, yet despite these glowing claims some provide inconsistent quality while others are downright unscrupulous. We’ve solved this problem for you with the Diamond Certified Resource. Only local companies independently rated Highest in Quality and Helpful Expertise® earn Diamond Certified. Our rigorous rating and certification process starts with the in-depth pass/fail rating of each company’s customer satisfaction, license and insurances. Most companies can’t pass our rating and earn Diamond Certified, and every Diamond Certified company must continue to deliver on its promises to you, the consumer. That’s why we conduct ongoing customer satisfaction research and credential-based ratings and monitor each company’s performance. Every Diamond Certified company is backed by our powerful Performance Guarantee, so you’ll feel confident in your choice when you use our always-free web resource or Diamond Certified Directory. If you try unsuccessfully to resolve a disagreement with a Diamond Certified company, our mediator will work with you and the company to attempt to reach an agreement that both parties can live with. If the mediation fails to produce a mutually agreeable solution due to failure of the Diamond Certified company to honor contractual obligations, uphold industry standards or participate in good faith, we will refund your purchase price up to $1,000. 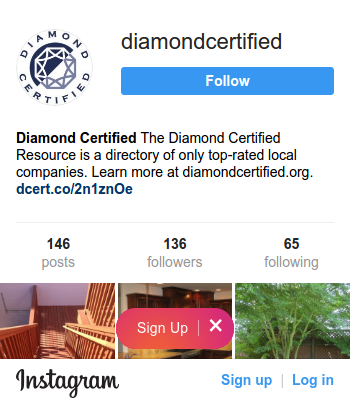 Each time you visit diamondcertified.org, you’ll see each Diamond Certified company’s Deep Info, including researched company rating reports, verbatim survey responses, essential articles, photo galleries, videos and expert tips. We put all the information you need to choose a company in one place, and no other web page can match this depth of information. When you choose a Diamond Certified company, you’ll never be fooled by fake or cherry-picked reviews because we survey a large, random sample of each company’s customers by telephone (typically 100 surveys) to get the most accurate ratings and verify only real customers are responding. Company owners can’t cherry-pick by telling friends and selected customers to post 5-star reviews on our site—we don’t allow it. So, if you want quality, you’ll have confidence in choosing a Diamond Certified company. We encourage you to visit this website on a regular basis to find updated ratings on top rated companies in your area, see verbatim survey responses on each Diamond Certified company, and read thousands of industry-specific expert articles and tips. 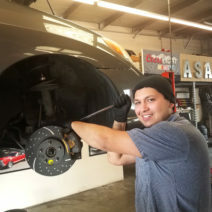 We care about customer satisfaction, and we care about you. We’re proud to give you all the information you need to choose with confidence. 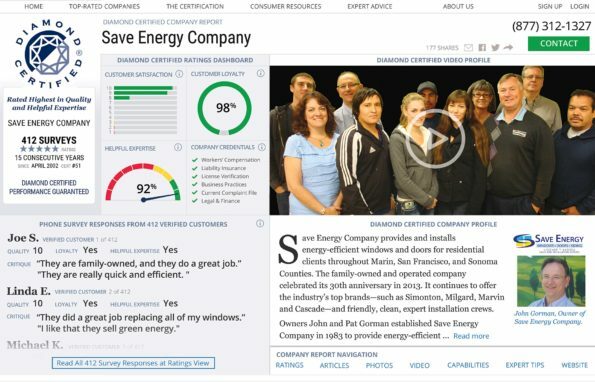 Find Local Companies Rated Highest in Quality and Helpful Expertise®. Performance Guaranteed. 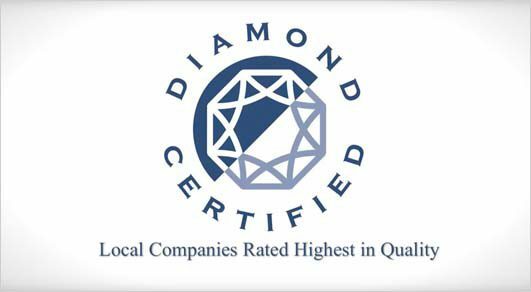 WHAT’S IN EACH DIAMOND CERTIFIED COMPANY REPORT? 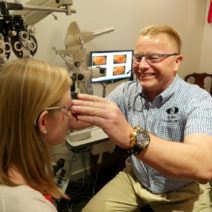 Known as The Savvy Consumer, Chris Bjorklund has been a Consumer Advocate for more than 35 years. She has worked with KPIX-TV, KGO, The Better Business Bureau, Consumer Reports, and as an Investigator for the Consumer Fraud Unit of the San Francisco District Attorney's Office. Chris puts her incredible consumer experience to work for you! I would say that they responded fairly quickly, they are fairly priced, and they did the job right. I liked the rapid response time. I'm really satisfied with the work they did. They were reasonably priced. They showed up on time every day and did good quality work. They worked with us when we knew nothing about the project. We remodeled a bathroom, and they walked us through the process. They really helped us, so I guess I would say that their consulting was excellent. They did their job in the time they said they would. Response to Diamond Certified Company Golden Restoration & Construction, Inc.
Nate Missildine is president of Legacy Construction, Inc., a Diamond Certified company. He can be reached at (408) 692-5918 or by email. 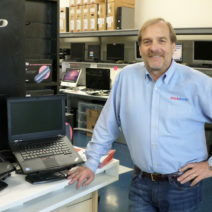 Simon Spark is president of Build SF, Inc., a Diamond Certified company. 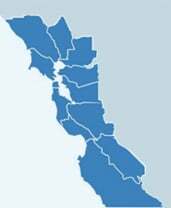 He can be reached at (415) 992-3027 or by email. William Young is owner of Edge Roofing, a Diamond Certified company. He can be reached at (415) 529-6796 or by email. Rory Moore is owner of RM Construction, a Diamond Certified company. He can be reached at (415) 534-5497 or by email. Nikolaos Margaritis is president of Kyvos Construction Inc., a Diamond Certified company. He can be reached at (510) 394-4929 or by email. Brian Folden is president of Fireside Property Management, a Diamond Certified company. He can be reached at (408) 498-7959 or by email.